C.1905, Ansonia Royal Bonn, "Crystal Regulator No. 4" shelf clock in good original condition. 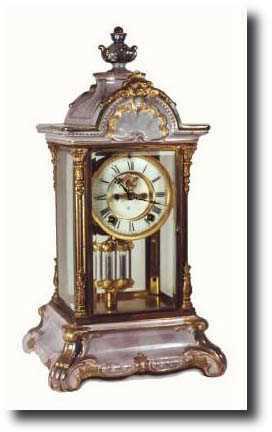 This clock is the color of a light gray pearl, with a rainbow glaze, and gold and green highlights. Porcelain dial and all beveled glass are excellent, and there are no chips nor cracks in the case. A few of the gold highlights have been rubbed off due to regular dusting. Retains original fancy pendulum with cast and gilt top and bottom. Runs and strikes OK, but would benefit from cleaning. There has been considerable demand for these Bonn crystal regulators over the past few auctions. Height 17 "